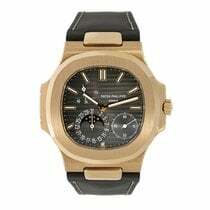 The watch comes complete with Patek Philippe box and papers. Avi and Co is a re-seller of luxury watches and not an authorized dealer of the related brand. The watches may come in either “unworn” or “unused” condition or they may come “previously owned.” Avi & Co. will indicate this condition on the product listing, in the absence of any condition notes the customer should assume the watch to be “previously owned”. The manufacturer’s warranty is not valid for resale items. Avi & Co does provide a warranty through our website using our own authorized watchmakers that covers valid manufacturer’s parts that at time of sale. Should the buyer make alterations to said parts the warranty will no longer be valid. Avi & Co is not responsible for the validity of the manufacturer’s warranty and does not act as a representative for the customer in warranty disputes with the manufacturer. Avi & Co is happy to assist our customers in their purchase process.